City and team officials Tuesday emphasized the importance of the Chargers football team to San Diego in encouraging residents to vote in the upcoming general election, and especially to support plans for a downtown stadium. Measure C would set up a framework to build a stadium and convention center annex near Petco Park. Because it would raise hotel room taxes, it requires two-third support for passage. “A vote for C is a vote to keep the Chargers in San Diego. It’s also a vote for the future of our city,” said Mayor Kevin Faulconer, who endorsed the measure after agreeing with team officials on certain safeguards. “I believe it’s very important for San Diegans to have professional sports — it brings us together just like music, arts, strong cultural institutions — professional sports are one of the building blocks of a world- class city,” he said at a news conference where he was flanked by Chargers President A.G. Spanos. While the Chargers’ plans to build a new stadium in Los Angeles County, in conjunction with the Oakland Raiders, was shot down by National Football League earlier this year, the team has a deal in place to become the second team in a future facility in Inglewood, along with the Rams. 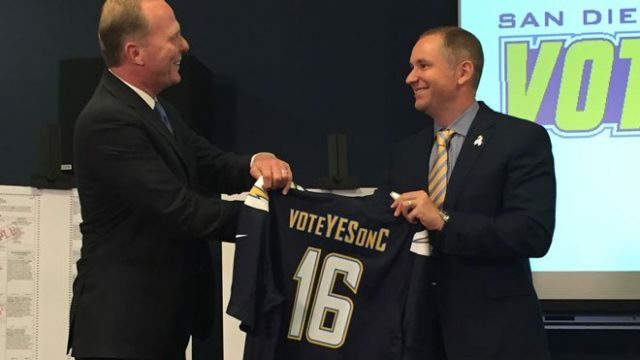 With Measure C trailing badly in the polls, it’s unclear whether the Chargers would exercise that option if the proposition fails next month. Some observers have suggested that Faulconer’s agreement with the team could lay the foundation for a Plan B in San Diego. Chargers President A.G. Spanos handed the mayor a No. 16 jersey that said “Yes on C” on the back. Chargers signal-caller Philip Rivers said he took Peyton Manning’s retirement speech about being the quarterback of a city to heart, and understands the “special bond” of the community with the team. Opponents contend that Measure C would be a giveaway to a billionaire owner, and that the mayor’s deal with the team to protect the city’s general fund from a shortfall in new tax revenue is not legally binding. The city’s hotel room tax is currently 10.5 percent, plus a 2 percent fee that funds tourism marketing. If Measure C passes, the rate would rise to a total of 16.5 percent.